I love to understand general principles and methodes, and to create things (bring ideas on the material level). I wrote about 260 patents and created a number of fine well-known educational puzzles (Happy Cubes and Cricro Puzzles, Snuzzles) and some original concepts in game-development. 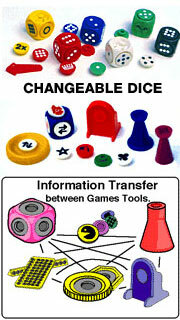 (interacting changeable dice and other gameparts). These puzzles reformulate in a very simple logic concept three-dimensional thinking and provoke mathematical skills. I was involved with video compression technology , and till 2011 also in plasma technology. Now (2016) I focus on solar energy. I am Master in Political and Social Sciences. Now instead of creating puzzles I want to solve your puzzle: bring you the Unification Key ... and the Joy of Tunity. If you have questions about my holon approach you can email me at dirk.laureyssens (at) gmail.com. I have some movies related to my holon theory on youtube. This is the link. Thanks for visiting my website, and have a fine harmonic life! © Dirk Laureyssens , 2002-2009. All rights reserved.